The first scientific studies of what was to become the GenSYS solution were carried out in 2007. In 2009, this work was followed through a research project funded by the IDEA Program of the Portuguese Innovation Agency. This project aimed at the development of new Product Data Management models, for high product diversity and mass customization environments. The flexibility of the models to suit industrial companies from different sectors and with different products, was also one of the proposed objectives for these new models. The Human Machine Interface Excellence project, HMIEXCEL - Bosch Car Multimedia Portugal, SA and Universidade do Minho partnership - established in 2013, allowed the consolidation and development of the remaining functional areas of the Manufacturing Planning and Control system (medium term) and production scheduling (sequencing, allocation and control of the shop floor activities) using electronic kanbans. The market demands and our customers requests led in 2016 to the creation of GenSYS, a University of Minho Spin Off, awarded that year with the first prize of the competition SpinUM. GenSYS, is a rule based system – you don’t have to teach GenSYS everything about everything. Save your time and effort. Create rules and conditions and let GenSYS do the rest. Minimizing human effort in managing this "information explosion" - through a new PDM model, based on Generic Structures that automatically generates complete and detailed bills of materials and process plans. Normalizing the organization's procedures, removing unwanted effects caused by diversity. The GenSYS System fulfils this design without loss of efficiency when compared to the mass production systems, allowing the interaction with other platforms and the integration with industrial equipment. Performing production scheduling tasks using automated and dynamic calculation of electronic kanbans, ensuring at each position the necessary skill and availability of the necessary resources at the right time, in order to meet delivery deadlines. 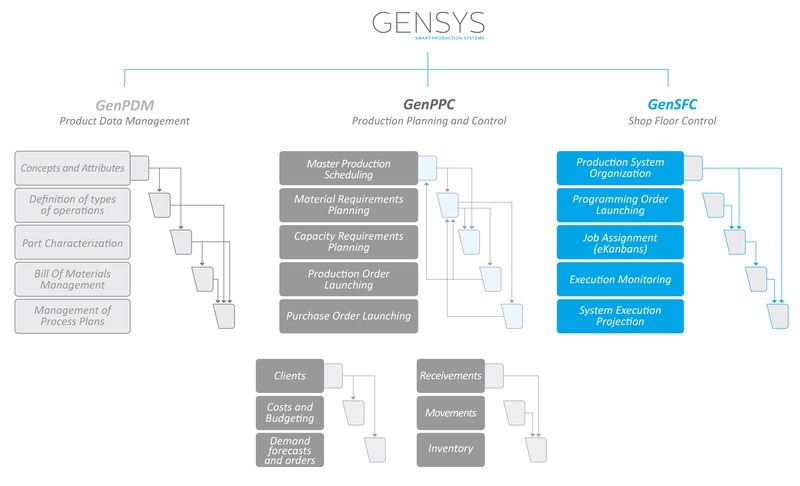 The GenSYS system also monitors production along the entire supply chain, from the raw materials in the suppliers to the final product and shipment to customers.